VANCOUVER , July 25, 2018 /CNW/ - IsoEnergy Ltd. ("IsoEnergy" or the "Company") (TSXV: ISO; OTCQX: ISENF) is pleased to announce that it has intersected an interval of uranium mineralization in drill hole LE18-01A, the final drill hole of its eight-hole summer core drilling program. Drill hole LE18-01A was completed on the 100% owned Larocque East property (the "Property") in the Eastern Athabasca basin, Saskatchewan (Figure 1). The drill hole intersected a broad, 8.5-metre-long interval of elevated radioactivity (>500 counts per second (cps) on a hand-held SRAT SPP2 scintillometer (the "SPP2")). The broad interval includes a 2.5-metre-long subinterval of moderate to strong radioactivity that measures >2,500 cps on the SPP2. Within the 2.5-metre-long subinterval is a 1.0-metre-long zone of strong radioactivity that measures >15,000 cps, which is off-scale on the instrument. Pitchblende is present and is associated with clay and hematite. Craig Parry , Chief Executive Officer commented: "I'm very pleased to announce this successful exploration result in the prolific Eastern Athabasca Basin of Saskatchewan. With a turn-around in the uranium price anticipated in the short and medium term, this is a perfect time for exploration success. Our strategy of opportunistic growth through exploration in the Athabasca and acquisition of undervalued uranium assets has put the Company in a solid position to benefit from improving market conditions." Steve Blower , Vice President of Exploration commented: "We're fortunate that our first drill hole at Larocque East has intersected a new zone of strong radioactivity in an area with ample room for expansion. Our technical team of Andy Carmichael (Senior Geologist) and Justin Rodko (Exploration Geologist) have done a tremendous job of compiling and interpreting the historic data and developing the drill target that was successfully tested during this program." Drill hole LE18-01A was designed to explore beneath historic drill hole KER-12 on the Larocque Lake conductor trend. KER-12 intersected elevated uranium geochemistry and moderate to strong alteration in the sandstone 165 metres east of the western property boundary. LE18-01A was drilled parallel to KER-12 and intersected the unconformity 57 metres north of KER-12 (Figure 2). LE18-01A penetrated 42 metres of overburden followed by Athabasca sandstone to 344.9 metres and then basement metasedimentary gneiss to the end of the hole at 494 metres. The radioactive intervals are summarized in Table 1. Mineralization within the broader 8.5-metre-long interval of elevated radioactivity straddles the sub- Athabasca unconformity and consists of fracture controlled and disseminated pitchblende with hematite and clay from 338.5-347.0 metres. Included within this interval is a dark grey to black 2.5-metre-long subinterval of moderate to strong radioactivity from 344.5-347.0 metres that measures >2,500 cps on the SPP2. Within the 2.5-metre-long subinterval is a 1.0-metre-long zone of strong radioactivity from 345.0-346.0 metres that measures >15,000 cps on the SPP2 (off-scale on the instrument). The interval of strong radioactivity is characterized by semi-massive pitchblende. Basement immediately beneath the mineralization consists dominantly of bleached and clay-rich graphitic cordierite augen gneiss that hosts two large fault zones (cataclasites) at 354.7-356.3 metres and 423.2-431.5 metres. These brittle faults are likely responsible for a 15 metre difference in the unconformity elevation between LE18-01A and KER-12. The Property covers a 15-kilometre-long northeast extension of the Larocque Lake conductor system; a trend of graphitic metasedimentary basement rocks that is associated with significant uranium mineralization in several occurrences to the southwest of the Larocque East property. The closest of these are the Larocque Lake and Larocque North zones, which are located 6.5 kilometres and 0.4 kilometres, respectively, to the southwest of the western Larocque East property boundary. 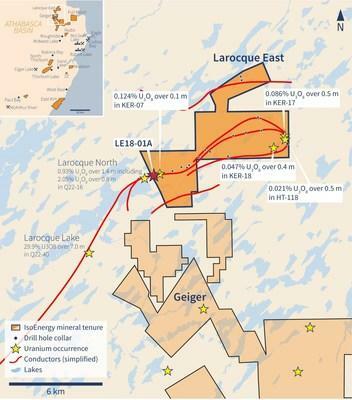 Drilling at the Larocque Lake zone has returned historic intersections of up to 29.9% U3O8 over 7.0 metres in drill hole Q22-040. Drilling at the Larocque North zone has returned intersections of up to 2.05% U3O8 over 0.8 metres in drill hole Q22-16. Like the nearby Geiger property, Larocque East is located adjacent to the Wollaston-Mudjatik transition zone - a major crustal suture related to most of the major uranium deposits in the eastern Athabasca Basin. Importantly, the sandstone cover is thin, ranging between 140 metres and 330 metres in previous drilling. A total of 23 historic drill holes have been completed on the Property along approximately 22 kilometres of graphitic conductors. Five drill holes have intersected weak uranium mineralization on the Larocque East property to date, including drill holes KER-07 (0.12% U3O8 over 0.1 metre) and KER-11 (0.06% U3O8 over 0.5 metre) near the western property boundary, within the general vicinity of drill hole LE18-01A. Geochemical results are expected within four weeks. These results will be compiled with geological and geophysical interpretations and clay reflectance data to define targets for follow-up drilling. Follow-up potential along-strike is limited only by the property boundary 165 metres to the west. The closest drill hole along-strike to the east is 415 metres away and was likely drilled too far to the north to intersect the prospective stratigraphy cored by LE18-01A. On section, follow-up potential is limited only by historic drill hole KER-12, which intersected the unconformity 57 metres south of LE18-01A. Follow-up drilling will likely start with additional fence holes on section with LE18-01A followed by step-outs along strike to both the east and west. Timing of the follow-up drilling is yet to be determined. The originally planned 8-hole summer drilling program is now complete. LE18-01A was the only drill hole completed at Larocque East. The other 7 drill holes were completed on the Geiger property to follow up mineralization in winter 2018 drill holes GG18-08 and GG18-09. Although some weakly elevated radioactivity and indicative alteration was intersected in the vicinity of drill hole GG18-09, no significant uranium mineralization was intersected. The scientific and technical information contained in this news release was prepared by Steve Blower , P.Geo., IsoEnergy's Vice President, Exploration, who is a "qualified person" (as defined in National Instrument 43-101 – Standards of Disclosure for Mineral Projects). Mr. Blower has verified the data disclosed. This news release refers to properties other than those in which the Company has an interest. Mineralization on those other properties is not necessarily indicative of mineralization on the Company's properties. An RS-125 hand-held spectrometer was used to verify that the radioactivity is due to uranium. As drill hole LE18-01A was drilled steeply at -70 degrees and the mineralization is interpreted to be horizontal, the true thickness is expected to be approximately 90% of the cored intervals. IsoEnergy is a well-funded uranium exploration and development company with a portfolio of prospective projects in the eastern Athabasca Basin in Saskatchewan, Canada and a historic inferred mineral resource estimate at the Mountain Lake uranium deposit in Nunavut . IsoEnergy is led by a Board and Management team with a track record of success in uranium exploration, development and operations. The Company was founded and is supported by the team at its major shareholder, NexGen Energy Ltd.